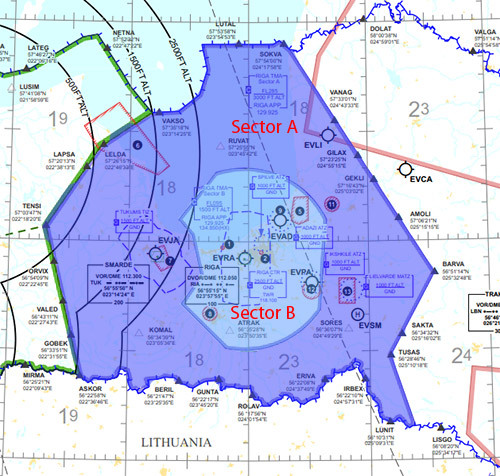 Welcome to the website of the Latvia vACC, Virtual Area Control Center for Latvia airspace on the VATSIM Network. On this web site you will find information on how to become a controller within our vACC, or how to find and use all necessary information about flying in Latvian airspace. Latvia vACC is part of the VATSIM Europe Division which, together with VATSIM UK, VATSIM Russia, forms the VATSIM European Region. All together, they are a part of the global VATSIM Network, which provides Air Traffic Control Service over the Internet, free of charge to pilots connected to this network using their flight simulator. If you are new to VATSIM and don't have an account, follow this link to become a registered member. If you've had an experience which you would like to give us feedback about, you're encouraged to fill out our online form, available HERE. Sector file data updated to include new SID procedure identifiers. SMR updated once again with taxiway and IHP changes, stand lines extended on apron 3 (west side). Frequencies updated in advance of changes in next AIRAC publication (Riga Tower 118.100 -> 118.105; Riga Ground 118.800 -> 118.805). Due to VATSIM limitations, this will just be a change in ATC spoken procedure, not actual used frequencies. New: From this year, the Tower controller will no longer speak the frequency of Approach controller with a take-off clearance. Instead, it is the pilot's responsibility to switch to EVRA_APP (or EVRA_B_APP if online) before passing altitude 1,500ft (or as soon as is reasonably practical). Please ensure you are following this procedure which has been published in AIP and every chart for some years already. In addition: if you receive no instructions after landing, switch to Riga Ground (118.805) when runway vacated. Website Briefing and ATC Training pages updated, and updated radio telephony guide revised and published. EVRR Sector file updated to reflect new stand numbers coming in AIRAC 1712 cycle (AMDT 010/2017) on Apron 2. ATIS files updated to reflect the real world syntax and released as a separate package on GNG. Charts for Riga and Ventspils updated, enroute charts updated, and FRA charts added. New scenery was released for EVRA, compatible with P3D v3, P3D v4, and X-Plane 11. Download information can be found on the scenery page. Riga Intl. (EVRA) aerodrome and Heliport charts are updated. En route charts are also up to date. Statistics for traffic and ATC updated here. Week 5 2015 Iron Mic' achieved by EVRA TWR! Week 4 2015 Iron Mic' goes to EVRA TWR and APP, EVRR CTR took 2nd place! ATC / Traffic statistics section avail here. BALT_CTR new frequency is 132.300Mhz. (Prev. was 132.320) Effective Sept 01.Y16. EVLA ATIS Removed. Effective Sept 01.Y16. 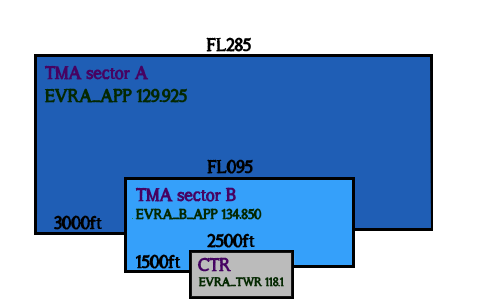 Starting with AIRAC 1304, effective 04 April 2013, a new ATC position is introduced in Riga TMA. Until this time, Riga TMA consisted of two sectors - A and B, but they were controlled by a single position - Riga Approach (EVRA_APP) on 129.925. Now during high traffic loads or at ATC discretion it can be separated in two positions - sector A (the bigger one) remains controlled by EVRA_APP, and sector B - by Riga Approach (EVRA_B_APP) on 134.850. Also lateral limits of sector B have changed a bit (see the map below; before that it was 25nm circle around RIA VOR). Note that both positions share the same callsign - Riga Approach. If both APP positions are online, their duties are separated as shown above. If there is only EVRA_APP online, it controls both sector A and sector B (as it was before). Normally EVRA_B_APP should not be online alone, but as it might happen in Vatsim, it will be left to controllers discretion, if he also assumes control of sector A. In typical operations, arriving aircraft can expect STARs in EVRA_APP and vectoring in EVRA_B_APP, but it might be different depending on traffic situation, controllers preferences or pilot request. When changing from EVRA_APP to EVRA_B_APP, state only your callsign. Copyright © 2019. Latvia vACC.